This course is a millennias-of-philosophy thumbnail designed to equip students with skills that are essential to intellectual thought. Non-philosophical audiences, from fishermen to astrophysicists, struggle with cruxes that philosophers in a particular canonical field work on. Philosophic insights are inseparable from human existence and its applications are numerous, wheather in design, programming, communications, toxicology, policy etc. Classes will consist of short and clear lectures combined with interactive activities and lively debates. This course will be conducted in the simplest possible English. – Identifying the object and essential function of Ph. Course 2. Fundamentals of Ph. 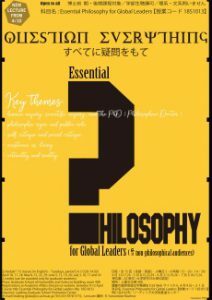 – Exploring the ideas of 10 major philosophers in a single lecture. Students willing to fulfill the optional objective are encouraged to dedicate as little/much time they wish to search for a philosopher that they can meet before the end of the last course.